One American chestnut orchard. Hundreds of trees. And two very special volunteers taking the lead – meet Jack Lema and Jessica Lang. 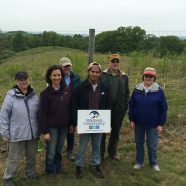 In 2012, Wildlands Conservancy planted 400 seedlings at Trexler Nature Preserve in Schnecksville to establish one of the first American chestnut orchards in the Lehigh Valley, aiming to reverse the impact of the chestnut blight brought on by imported Asian chestnut trees around the turn of the last century. Presently, more than 900 trees have taken root, and monitoring this effort is no small feat. Enter Jack and Jessica. The two are on site each month, May through October, sharing their expertise to coordinate all-volunteer teams to be caretakers of the orchard. A longtime lover of nature, Jack turned his passion into a career path by pursuing a B.S. in environmental science. He graduated from Moravian College in 2016. Jack gets a better a look at a seedling. In his spare time, Jack enjoys thrifting, hiking, folk music, kayaking, photography and learning ever more about the natural world. Jessica has an extensive background and experience in commercial real estate development and construction management. Jessica works together with another volunteer. She has managed all aspects of land acquisition, contract negotiation, project and property development, approvals and entitlements, financing, and property management. She holds a B.S. in biology with a focus on ecology from Penn State and is currently pursuing a master’s degree in environmental sciences and policy from Johns Hopkins University. Jessica and her husband Michael live in the Lehigh Valley with their two children. They enjoy traveling, getting outdoors and going to the beach together.